Norway may be home to beautiful scenery, but it’s also home to a dangerous stretch of coastline. The Stadhavet Sea is where the North and Norwegian seas meet, and is the most exposed and dangerous area along the coast of Norway. According to the nearest meteorological weather station, the area experiences between 45 to 106 stormy days per year. Even when the winds die down, the heavy waves continue, and ships often have to wait days for a safe passage.The combination of wind, currents and waves has caused 46 accidents and near-accidents and 33 deaths in the last few decades. All this is why the Norwegian Coastal Administration is building the world’s first ship tunnel. 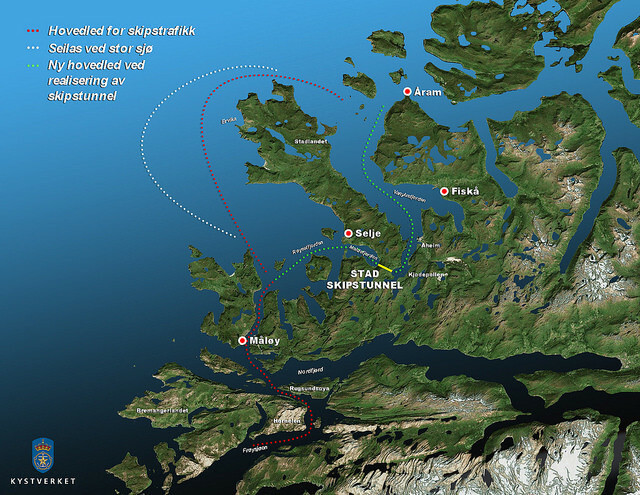 The Stad Ship Tunnel will be 1.7 kilometres long, 37 metres high and 26.5 metres wide, enough to fit a large cargo ship. It will traverse one of the narrowest areas of the Stad peninsula, between Vanylsfjorden in the north to Moldefjorden in the south. 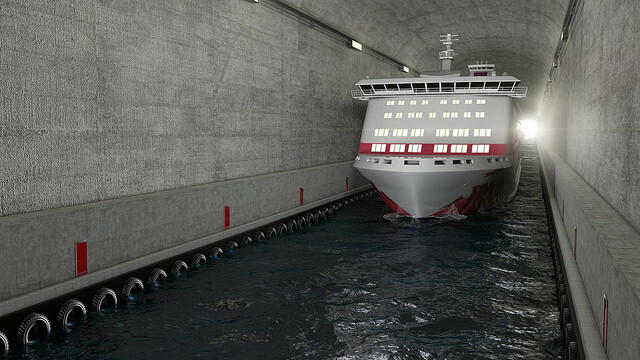 Because the ships will also be sheltered from excessive winds, the ship tunnel can be used in most weather conditions. The project will cost around NOK 2 billion ($235 million) and work should start in 2018. Proponents of the project say that the benefits will be widespread: it will not only be safer, it will also help move traffic from the roads to the sea, lead to an increase in foreign tourism, and have positive effects for the fishing industry and other industries. However, critics of the project argue that it is a flawed investment , because the danger posed to ships isn’t as great as it used to be. Ships nowadays are bigger and safer, and travel further out to sea, they argue. Norway is already a world leader in tunnel technology. It has the world’s longest road tunnel, the Lærdal. At 25 kilometres long, it takes 20 minutes to drive through. It’s also home to he world’s deepest subsea tunnel. The Eiksund Tunnel is 7,765 metres long and 287 metres below sea level.